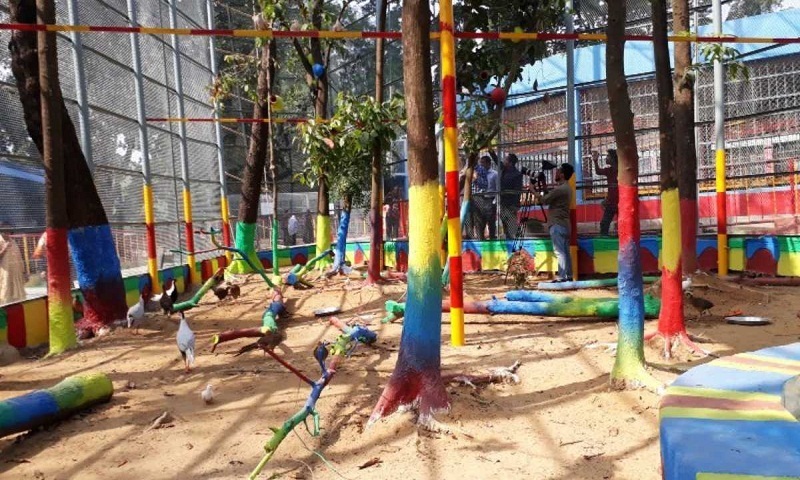 More than 3,000-4,000 enthusiastic animal lovers and visitors are coming almost every day to enjoy a wide range of display at Chattogram zoo with the new arrival of 342 birds of six species. The number gets double on holidays. Everyday bird lovers, mostly children, are enjoying various species of colourful birds including laughing doves, pheasants, parakeets, cockatiels, and even one pair of macaws. Talking to UNB, Chattogram Zoo Executive Committee member secretary and Hathazari Upazila Nirbahi Officer Ruhul Amin said they have made the new ‘Natural Mini Aviary’ in a bid to draw bird lovers according to the direction by the district administration. Spending all the proceeds that come from ticket sale, the infrastructure of the zoo has been enriched with modern facilities like installing a giant gate, setting up of surveillance cameras in different important points, making a kid zone, internal roads, public toilets, resting seats for the visitors, colouring zoo walls and planting more trees for healthy green environment. Meanwhile, they have brought a lion by exchanging it for a lioness from Rangpur Zoo on September 5. A pair of Zebras was brought from South Africa costing Tk 33 lakh on December 9, 2016. Recently, the authorities have added six more Zebra from South Africa costing Tk 48 lakh, he added. Earlier on November 2, the deputy commissioner formally inaugurated the aviary.